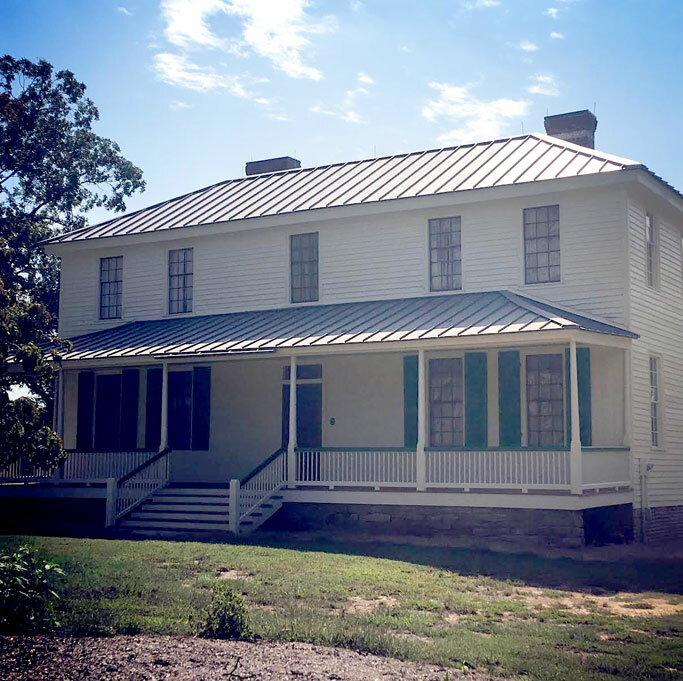 Hopewell Plantation is among Clemson’s historical treasures. Situated atop a hill that once overlooked the Seneca River — now Hartwell Lake — the property features the 19th century home of Governor Andrew Pickens, Jr. The manor was later home to two South Carolina governors and a U.S. congressman. In the 1930s, Clemson University took over managing Hopewell, converting it to a self-sufficient farm as part of a federal economic-relief program. Hopewell Plantation is representative of a rural house type, which was common in the 19th century in the South Carolina backcountry. Its historical significance rests on the Pickens family. The decades of negotiations General Andrew Pickens made with the Cherokees, Choctaws, Chickasaws, Creeks and Chickamaugas were monumental in peaceful treaties and cohabitation with Native-Americans following the Revolution. Most notably, the Treaty of Hopewell with the Cherokees, Choctaws and Chickasaws still today provides civil liberties to First Peoples. 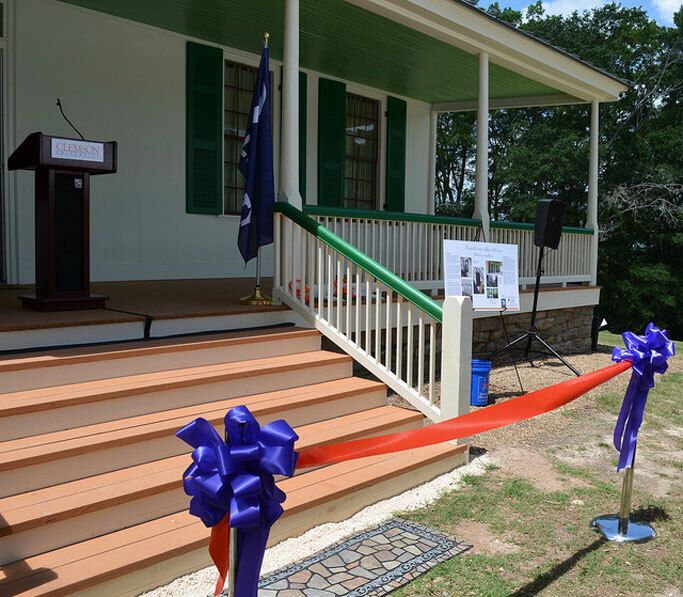 The 2017 Front Porch Restoration Project was made possible through our donors’ matching donations and the NSDAR’s Special Projects Grant through the sponsorship of the Andrew Pickens Chapter, NSDAR. The Treaty of Hopewell marked a new era of relations between the United States and Native American tribes. During his 20-year career as the commissioner of Indian affairs, “Skyagunsta” or the “Border Wizard Owl,” as Pickens was respectfully called by the Native Americans, successfully negotiated a series of treaties on his Hopewell Plantation. 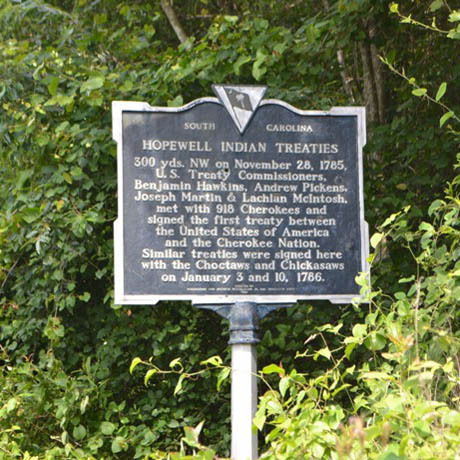 Three hundred yards northwest of the Hopewell property on November 28, 1785, U.S. Treaty Commissioners Benjamin Hawkins, Andrew Pickens, Joseph Martin and Lachlan McIntosh met with 918 Cherokees and signed the first treaty between the United States of America and the Cherokee Nation. Similar treaties were signed at Hopewell with the Choctaws and Chickasaws on January 3 and 10 in 1786. These treaties ended years of participation in the Revolutionary War for the Native Americans who had befriended the British and provided for prisoner exchanges, boundaries, trade, peace, and perpetual friendship.